As a writer, I spend a fair amount of time perusing the Internet, whether searching for inspiration, networking on social media, researching various topics, reading publications, or simply shopping and engaging in that familiar beast, procrastination. 2. Etsy. This site is chock full of fantastic art, accessories, home decor, and more, mostly made my independent artists. A few personal faves: Dakota Midyght's Etsy shop sells colorful, whimsical pieces (think dreamy owls, cozy mushrooms houses, and baby dragons). I framed two prints for my daughter's room from the Barking Bird shop, and I recently had an ottoman slipcover created by Nikki Designs. 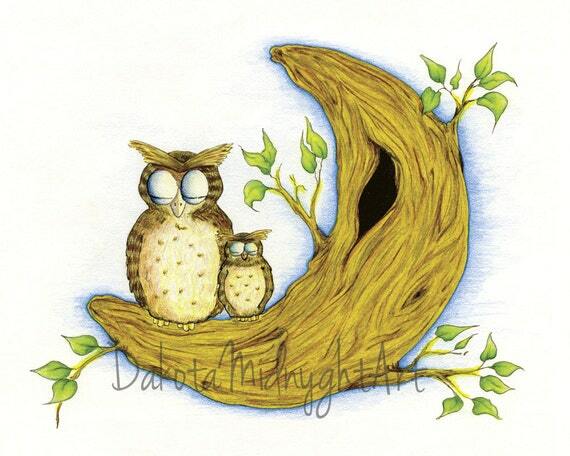 Lunar Owls by Dakota Midnyght is framed and on display in our playroom. 4. Beautiful Booze. My friend Natalie has devoted the past couple of years to developing her stellar reputation as a talented mixologist, party planner, food writer, and photographer. The cocktails she features (all her own creations) on her site are beautifully created and photographed, and they would make any party a hit. Classic Gin Martini created by Natalie of Beautiful Booze. 5. Goodreads. If you are a bookworm, this is a great free site. You can keep track of books you are currently reading, want to read, and have already read. Similarly to Amazon, people can rate and review books here. Like Facebook, you can connect with friends on the site, as well as follow your favorite authors. What are some of your favorite online destinations? Haha, I love me some Cartwheel app! :) I'll have to check out the Bloggess. It's been a while since I stopped by her page! These are all exciting new discoveries for me! Good of you to share ,great for me to know.Procrastination-here I come,head on!!! I also like the ' home tours' and 'call it a day ' features on design mom - houses from all over the world and ordinary days in lives of ordinary moms sometimes living in places I haven't heard the names of. 'Aunt Peaches'- great sense of eclectic craft! And then - 'Frantic Mama'- she is quite the magnet! I read seven of her 2011 posts today and well ,here I am again! I haven't heard of Design Mom-- how fun to peek into other people's houses all around the world! I will be checking that out! Oh, and you are too kind to mention little old me :).